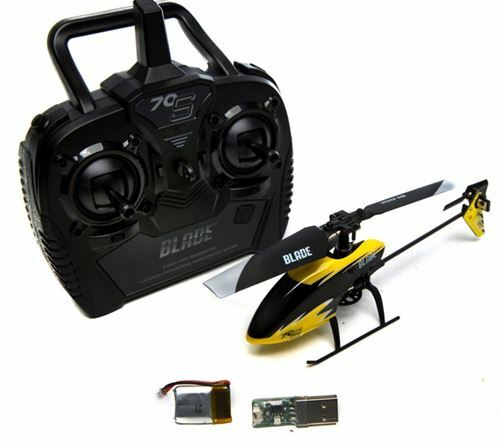 The Blade 70S is Blade's latest micro sized fixed pitch, single rotor, flybarless helicopter. It may be the eventual replacement for the mSR S; but there is one show stopper for some, and that's the fact that it's not Spektrum DSM2/X compatible. 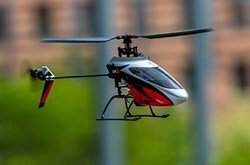 In short, this is not a BNF Blade Heli that you can bind to your Speky computerized DSM2/X radio. However, for the $60 ready to fly price tag with the included toy type 2.4 GHz spread spectrum radio and indoor flying environment; most will be able to live with that compromise. There is a DSM2/X work around however which I will get to shortly, but first, let's have a closer look at this neat little helicopter and why I consider it to be one of Blade's best micro fixed pitch offerings to date, regardless of not utilizing DSMX/2 protocol. 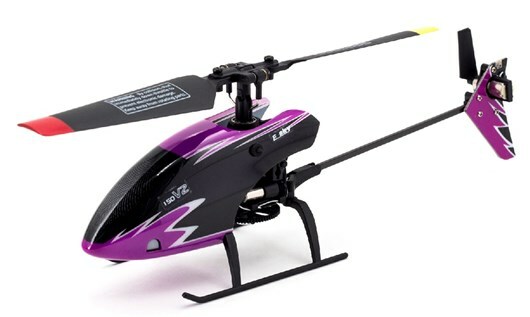 The Blade 70S is perfectly suited for the beginner who is looking for a super stable, strong, single rotor, fixed pitch heli to help learn the basics of flying a single rotor RC helicopter. For those that want to forgo the micro coaxials and start right out of the gate with a micro single rotor, this is one of the best heli's that Blade has ever released to suit this demand. It's much more forgiving and easier to fly than the mSR S, not to mention much less costly. 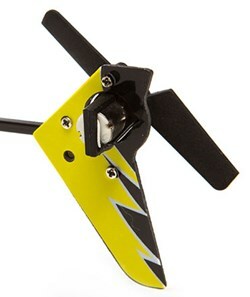 It is quite possibly, the most stable single rotor, fixed pitch micro heli currently on the market. The best news however for the micro single rotor newbie... The 70S is also much more crash resistant and a good deal less fragile. Why? 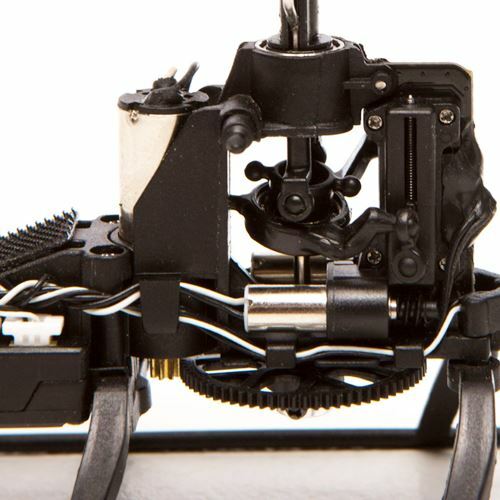 The design feature you will first notice is the placement of the swashplate. It's actually located within the frame and thus well protected from crash impact bustification. 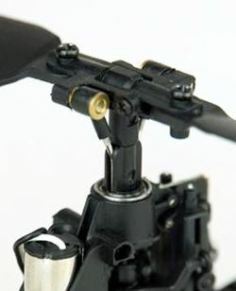 The unique wide rotor hub and large diameter upper mast bearing allow the two linkage pushrods to slide up inside the enlarged mast and then flare out to attach to the blade grips - DFC style. These pushrods are not only well protected, they are extremely durable, and the glass fiber infused composite plastic blade grips they attach to are also very strong. The end benefit to you is all the fragile bits that are normally out in the open and exposed, are now nicely protected. What is exposed is overbuilt. 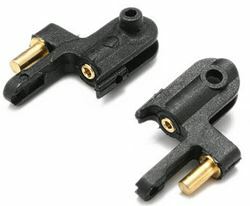 Next item to take a look at are what the other ends of these pushrods attach to - the two cyclic linear servos. 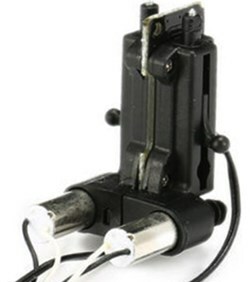 They are a one piece modular component which share a single, dual sided potentiometer board, sandwiched between the two worm gear driven output ball dirvers. This not only makes this "dual" linear servo assembly lighter and stronger, it actually becomes the rear half of the frame substructure once screwed to the frame; both increasing frame strength and reducing overall parts count. Brilliant design! Replacement part costs are likewise very reasonable, and slightly lower than we usually see from Blade. There is a reason which will be revealed shortly. The electronics are housed in a very strong shell that doubles as the front part of the frame substructure when screwed into position, increasing overall strength. The 70S's flying weight of 34g is 3g more than the mSR S, but that is next to nothing considering the beefier build and component protection. The electronics include the main and tail motor ESC's, tail mixer, motor plug sockets, receiver, servo sockets, battery plug socket, and a factory programming socket. 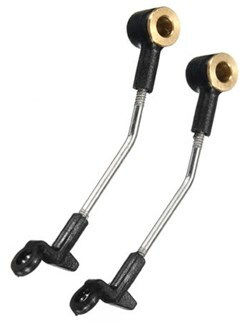 Obviously, the other main component is the flybarless stabilization system. By all accounts, this is not a Blade SAFE system at all, but rather the popular and very powerful micro sized CopterControl CC3D stabilization unit which utilizes 6 sensor stabilization (3 gyros & 3 accelerometers). Lastly, those with previous fixed pitch micro single rotor Blade helicopters will be very happy to finally see a properly protected coreless brushed tail rotor motor, robust motor mount, and strong tail fin. These have been a weak link on all of blade micro fixed pitch helis for years and I even had a section in my mSR/120SR ebook on how to protect them better. Not needed on the Blade 70S as the tail motor protection is outstanding. The tail boom is the customary strong & light weight square carbon tube with internal motor wiring that Blade has been using for several years now on all their micros. 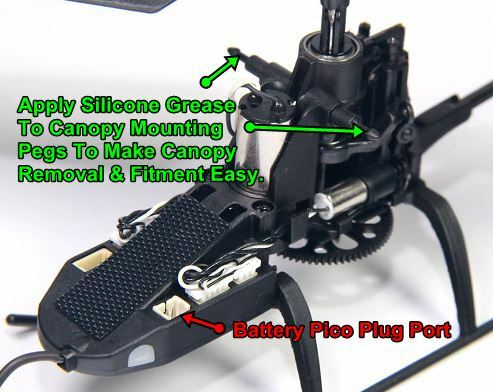 The Blade 70S is powered by a single cell (1S) 150mAh LiPo battery, but unlike other Blade micro helicopters that have the micro plug built into the end of the battery cap cover, this little micro pack uses a small pig tail wire with the micro RC connector (JST SH) on the end to plug into the control unit. Further, the battery is affixed to a more traditional battery mounting tray up front with Velcro over Blade's usual "holster" type battery mounts. The big positive is it gives you literally dozens of battery options. There are so many 1S 150-200 mAh LiPo cells on the market, some for next to give away pricing when you get 4 or 6 packs in combo deals. I personally hate being locked into proprietary batteries. Not a problem with the 70S. The negative is you have to remove the canopy to change out the packs. For most, this will be nothing but a minor inconvenience. A little silicone grease applied to the canopy mounting pegs make popping the canopy grommets off the pegs a piece of cake if you are finding the process tedious. It really is a non-issue. Flight times with 150mAh packs range from about 4-5 minutes and you can extend that by up to a minute if you use 200 mAh packs which are about the largest, and heaviest that can be stuffed under the canopy. Those times are flying to LVC (low voltage cutoff), not what I would recommend as battery life will be shortened substantially; so take up to a minute off those times if you want the real flight times that are LiPo safe (80% max discharge rule in other words). To save on costs, the Blade 70S comes with a very simple USB charger. There are of course JST SH para-boards and charge harnesses out there for other similar 1S packs. Just double check the polarity as it's not standardized and may require soldering to correct. You've heard me stating several times now, how stable this little fixed pitch micro is, but just how stable is that? The best likeness I can give is almost as stable as a micro coaxial such as the mCX or mCX2. It really will hover hands off with little correction required. Stationary pirouetting is pretty much drift free, but not as fast as the yaw rate on a micro coaxial (fine for a beginner however). I've yet to fly any micro that will pirouette as well and as fast as a micro coaxial, with their zero piro-drifting tendency, and dizzyingly quick yaw rates. However, the 70S comes close, and is better than what we saw on the Blade mSR in its 3 various versions (flybar, X, and S). This is no micro coaxial however when you start giving it cyclic input. Reaction to input is fast as is the flying speed. This is where it starts feeling like the mSR S while the self leveling is both quicker, and more precise. Kinda robotic feeling in fact. There is considerable dead band around center stick (no heli movement when sticks are moved slightly around center), just like lots of positive exponential rate is dialed in (cyclic & tail). I didn't like the feel, but it's entirely what you're used to. It's doubtful a beginner would even pick up on it. Throttle response is docile and a little delayed/mushy. Perfect for learning on! Unless you really have your heart set on a micro coaxial (perhaps for the longer flight times provided as they are more efficient), I feel any newbie could pick the 70S up and become comfortable flying it within a few battery packs. There is a button on the top left corner of the radio that allows you to switch between low and high rates. The programmed throttle response seems quite tame. This is no power monster. It's better than a coaxial however giving you faster climb-outs. 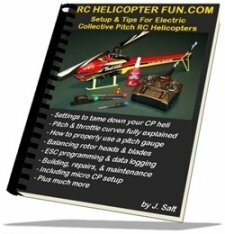 Nothing earth shattering mind you, but this is a low powered fixed pitch beginner heli after all. Cyclic response in outdoor/hi rate mode allows for greater cyclic banking angles and can get borderline scary in tighter spaces. The Blade 70S suffers horribly from "ballooning" when flying fast. This is common on all micro FP helis to some extent, but I really noticed it with the 70. It's caused by rotor disc lift imbalance and is made worse by the low head speeds all these FP micros run at. 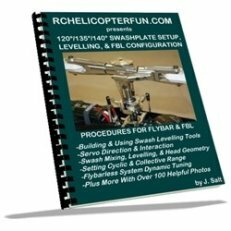 Ballooning is when the nose pitches up once you hit a certain speed because the advancing blade on one half of rotor disc is creating more lift than the retreating blade and due to gyroscopic precession, the heli noses upward even while holding in full forward cyclic. 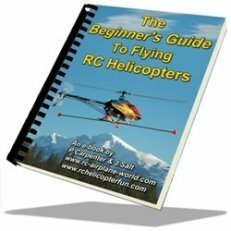 If you continue to hold in full forward cyclic, the nose will again drop and the heli will accelerate forward until it builds up enough lift imbalance in the rotor disc, it balloons again, and the whole cycle starts over. Some call this "porpoising" for the obvious reasons. When flying in the wind, things go south fast. As with any fixed pitch micro, wind will push the little 70S all over the place. So, yes, this is certainly an indoor only or dead calm outdoor flier. One PIA feature the Blade 70S has is a goofy throttle lock safety activation procedure. No throttle hold is possible on the toy like radio to keep the rotors from spooling, so they are doing what the quad rotor world seems to be so keen on, and that is to have some sort of rudder or aileron full stick activation to unlock/arm the ESC before you can throttle up. The process on the 70S requires you to hold in a full right rudder stick command for several seconds to unlock the throttle. The blue LED (which looks green while shining trough the yellow canopy) on the left side of the control board will then change from slow flashing to fast flashing, indicating you can now throttle up. You only need to unlock the throttle again with the full right rudder stick procedure if you land and power off the rotors for more than 10 seconds; or if you fly into something and the ESC automatically shuts down to prevent the motor and electronics from getting overloaded. That's a good segue into just how tough this little 70S is. It bounces off walls and ceilings without as much as a scratch. In my honest opinion, as anecdotal and subjective as it may be; the 70S is the most robust micro heli (single rotor or coaxial), that Blade has released to date. The only parts that I can see eventually getting damaged in moderate energy crashes would be the usual micro heli casualties (canopy, main blades, tail boom, & tail rotor blade). I do suspect tail motor replacements will also be a regular maintenance replacement item as brushed coreless tail motors always are. The usual lifespan of these tiny coreless tail motors is generally between 50 to 100 flights, and as replacements are not expensive (around $7 bucks), it's not a big expense. Yep, that's the big surprise and a very different departure for Horizon Hobby. It does however explain a good many things such as the low cost (for both parts and the helicopter), lack of Spektrum DSM2/X compatibility, and the heli design changes from what we normally see on Blade's micro helicopters. The Esky 150 V2 has been on the market for a while already (here's my full review on it). Blade's version should therefore not have the "sometimes" first batch release issues as it's using an already proven platform. 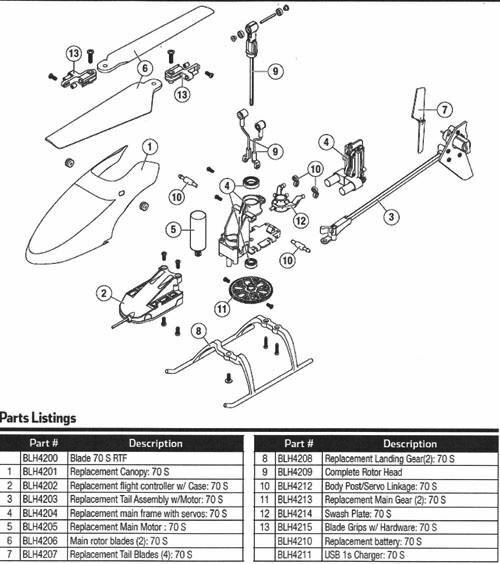 The best asset is you now have access to a vast parts support network from both Horizon Hobby and Esky. As we have come to expect with most of Blade's initial micro heli releases, there are always one or two parts that they run out of quickly and are on back order for many weeks. Well, fear not. If this happens, just get the same part from Esky. 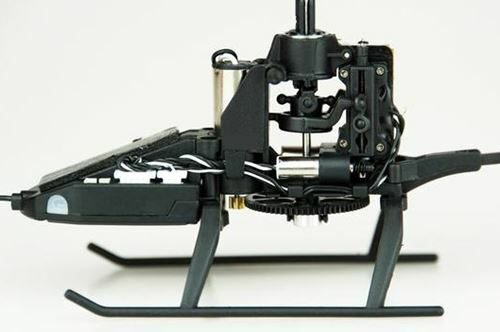 If you happen to like scale RC helicopters, specifically the Airwolf; Esky has a RTF version based on their 150 V2 mechanics called the the F150 V2. It's very important that if you decide to get the scale F150 Airwolf, make sure it's the "V2" version. Esky initially had one called the F150 and it flew like a pig! If you really like the idea of the Blade 70S, but are completely turned off because there is no BNF version to pair to your computerized Spektrum radio, there are a couple work-arounds. First is to get the Esky 150 XP2 instead which is about $15 bucks less ($45) USD). The XP2 version of the Esky 150 V2 comes without any internal RX or toy like radio; but allows S-Bus, PPM, and DSM2/X Satellite RX connectivity through a separate plug port underneath the CC3D control board. 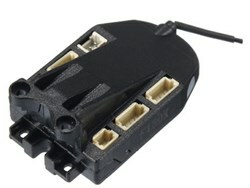 Please note, this port is not on the Blade 70X or the Esky 150 V2 versions. The satellite receiver is stuck to the bottom plate under the main mast by way of the included 3M double sided tape. 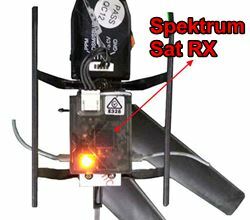 The 150XP comes with several wiring harnesses for the various RX connectivity methods (Speky satellite is of course one of them). The big draw back other than appearance and weight increase, is that programming the CC3D unit for the different RX types is not something most RC newbies are going to enjoy, or perhaps even be able to accomplish. You need to download an open source programming software called "OpenPilot GCS 15.02.02". OpenPilot software also allows you to change the CC3D stabilization & configuration settings. You'll also need to get the special CC3D setting file (uav.) for whichever signal format you are using (DSM, SBUS, or PPM). Google search will yield results, or you can find the uav. files at Zonda Hobby's web site. Again, this is for advanced users, and to be perfectly honest, something I can't stand wasting my time on, over such a simple little heli, but it's the one way you could fly it with your Spektrum TX. There are several forum posts that discuss the pairing of the eSky 150XP with Spektrum if you use your Google Fu. Here is a very basic outline of the connectivity procedure. If you do happen to like the high visibility yellow canopy and tail of the Blade 70S, you could always purchase those parts separately for the eSky 150XP. 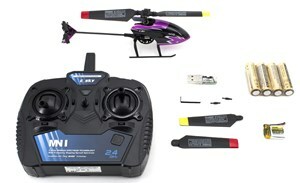 The other option would be to get the Blade 70S, fly it with the cheap toy radio for awhile, and if you feel you still want to bind it to your computerized Spektrum radio, purchase the ESky 150XP CC3D control board. Thing is, those control boards are going for about $30 beans, plus you need to get a Speky sat RX, and programming cable. Speaking of the DSM2/X satellite receivers, for the low cost of these little micro heli's and primarily indoor only flying environments, I'd likely get one of the inexpensive micro versions from Orange, Lemon, Redcon, or SP09X. I also strongly suggest removing the protective plastic case that some of these micro satellite RX's come in to save weight. Every gram counts on a micro heli of this size and low power output. The plastic cases on most of these 3 gram DSM2/X satellite receivers are about 2 grams alone! 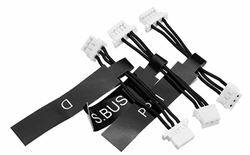 If you are concerned with short/component protection, encase the circuit board in light weight heat shrink or clear tape after you remove them from the case. No question however, having an external RX on the XP version over the built in one in the 70S or Esky 150X, is more prone to damage. Again, the 150XP version should be considered for more accomplished RC hobbyists and the RTF 150X and Blade 70S for true beginners; or those that don't want to waste time with additional programming hassles, and want to keep the weight of their little micro to a minimum, plus keep the appearance clean. Personally, I would just get the Blade 70S or Esky 150X and deal with a cheap toy radio. Just take this radio with you and leave/save your good one for your bigger machines in other words. That says volumes considering how I always harp about only using a good computerized radio. 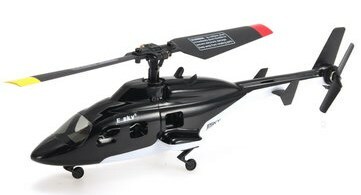 However, on a little indoor fixed pitch heli like this that is so stable out of the box, and has built in hi/low dual rate/stabilization program selection; the customization advantages of a good computerized radio will not be utilized much. Naturally the better build and gimbal quality on a good radio will be appreciated, but is it worth the added hassle and price? Only you can decide that. If you must get a BNF DSM2/X micro FP heli that you want to bind with your Speky computerized radio and don't want all the programming and fitment hassles that you'll be faced with on the 150XP, there is always the Blade mSR S.
Unfortunately it's not as stable or as robust as the 70S. Why get one over the other? Yellow vs. purple color choice; with Blade you will get the customary good product support & after-sales help should you need it. Either from the hobby shop you purchased your 70S from, or from Horizon Hobby's technical support team. With Esky, depending of course where you purchase it, you usually get squat for support! Most Esky 150 V2's are available from the usual online Chinesium sources. You may get them for $10 bucks less than a 70S from the local hobby shop, but you will likely be on your own afterward. ESky's version however has twp little red LEDs in the top of the tail fin. If you are an LED light junkie like I am, that will push the coolness factor in its direction.